The Lions, beaten finalists for three years on the trot, will be wondering what more they have to do to actually secure the Super Trophy for their display cabinet in 2019. Their first attempt at the trophy foundered in New Zealand as they bent the knee to the Hurricanes in the 2016 final, going down by 20 to 3 on a day where the demons inside his head nearly broke Elton Jantjies in two. In 2017 they had all the advantages. A home final against the Crusaders, a stadium packed to the rafters with 60 000 vociferous Lions supporters, the high altitude of the South African Highveld. The experience of the previous final to draw on. This would be the Lions year! It was all going according to plan when Kwagga Smith chased a kick with just too much intent, and received a red card for his efforts. The Lions fought valiantly right to the end, but a man down against the All Black-laden Crusaders was just one step too many. The Crusaders took the game 25 – 17 and the trophy remained in New Zealand. Once again, in 2018, it was the Lions and the Crusaders, but the venue was reversed. The Lions had to do the travelling and that caused their eventual unravelling as they went down 37 – 18 – fighting to the end, but visibly running on empty. There is a minor issue standing between the Lions and a trophy, or even a fourth consecutive final. They have lost a host of senior players to overseas clubs, with the majority succumbing to the poaching expeditions of their previous coach, Johan Ackermann, who swooped with a Gloucester chequebook in hand to signed a bunch of his previous players to join him in England. In addition to the player drain, many members of the remaining squad are likely members of the Springbok squad for the 2019 Rugby World Cup. These internationals are likely to be carefully nurtured and given restricted game time to manage their workload and focus on getting them to peak fitness when the World Cup kicks off. There is some stability and continuity in the Lions’ coaching squad. The player drain has hammered the Lions as the majority of Ruan Dreyer, Jacques van Rooyen, Corne Fourie, Franco Mostert, Jaco Kriel, Marco Jansen van Vuren, Ashlon Davids and Rohan Janse van Rensburg head overseas for more lucrative contracts. 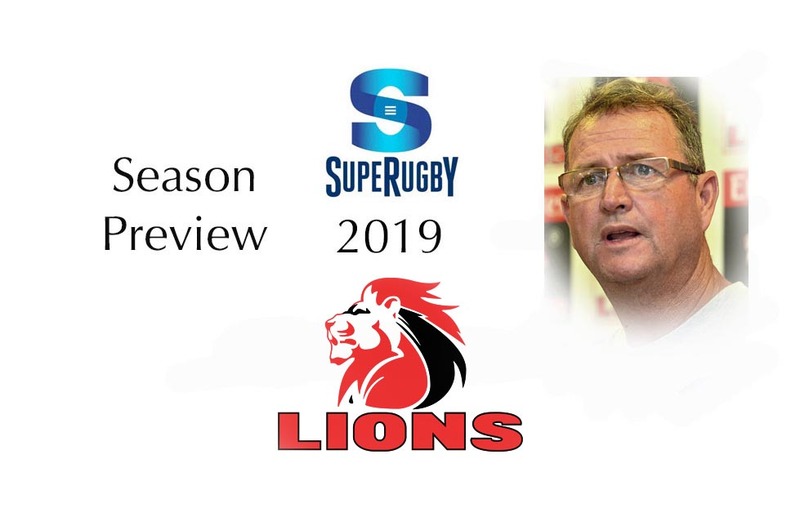 Effectively, the best side the Lions could put on the field in the last year will now be without Dreyer, Van Rooyen, Mostert, Kriel and Janse van Rensburg for their 2019 efforts. That hurts. Trying to offset the loss of talent to the Euro and Pound are the arrival of just three names, Danie Mienie, Carlu Sadie and Stephan Lewies. These are three quality players , but the scale is still tipped towards the losses rather than the gains. The Lions retain some very big names in the South African rugby world. None more so than Malcolm Marx. He is a one-man wrecking ball of a player, and his influence was evident whenever he was not available for the Lions due to injury. When he plays for the Lions they tend to dominate a game, without him they often play well, but do not have the edge that he provides. But no single player makes a team. The Lions have some others who must not be forgotten. The sensational debut season of Aphiwe Dyantyi creates much expectation for 2019. Ruan Combrinck will be wanting his Springbok berth back after a poor 2018. Kwagga Smith, Warren Whiteley, Ross Cronje, Elton Jantjies, Lionel Mapoe, Cyle Brink, and Courtnall Skosan will all be wanting to stake a claim for a green-and-gold World Cup blazer. The Lions will be pushing hard for the top spot in South Africa and, possibly, another final appearance.